What Is DA Form 2173? DA Form 2173, Statement of Medical Examination and Duty Status is a form used during Line of Duty Investigations (LDI) in cases when a Soldier receives an injury, illness or disease during Active Duty service, Inactive (IDT) and Active Duty (AD) training or traveling to and from IDT/AD. The latest version of the form was released by the Department of the Army (DA) in October 1972. An up-to-date fillable DA Form 2173 is available for download and digital filing down below or can be found on the Army Publishing Directorate (APD) website. The DA Form 2173 must be completed by the authorized personnel no later than 7 days after receiving notice of the injury, illness or disease unless the injury was not a direct result of Active Duty or IDT. The form expires either in 60 days after the incident (in case of an informal LDI) or in 90 days (in case of a formal LDI). The statement must be submitted within the adequate period of time for all allowances to come into effect within 30 days after reported injury, illness or disease. The completed DA 2173 must undergo a detailed review and be approved by superiors for the continuation of incapacitation benefits. How To Fill Out Da Form 2173? For use of this form, see AR 600-8-4, the proponent agency is DCS, G-1. (Attach Psychiatric evaluation if appropriate). IS NOT LIKELY TO RESULT IN A CLAIM AGAINST THE GOVERNMENT FOR FUTURE MEDICAL CARE. WAS NOT INCURRED IN LINE OF DUTY. REPLACES DA FORM 2173, 1 JUN 66, WHICH IS OBSOLETE. Regulation AR 600-8-4, released on September 4th, 2008, contains a detailed overview and instructions for the statement of medical examination and duty status. Detailed instructions are provided below. The DA Form 2173 and - if applicable - the DD Form 261, Report of Investigation Line of Duty and Misconduct Status are prepared during the LDI. Five copies of the DA 2173 must be provided for active duty personnel. The form may only be verified by an MTF commander, an attending physician or a patient administrator. All personal data must be reviewed and checked. Changes made in pen and ink are allowed. The form must be returned to the unit commander or the MTF commander in case other corrections are needed. An investigation officer can be appointed in case any further investigation is required. 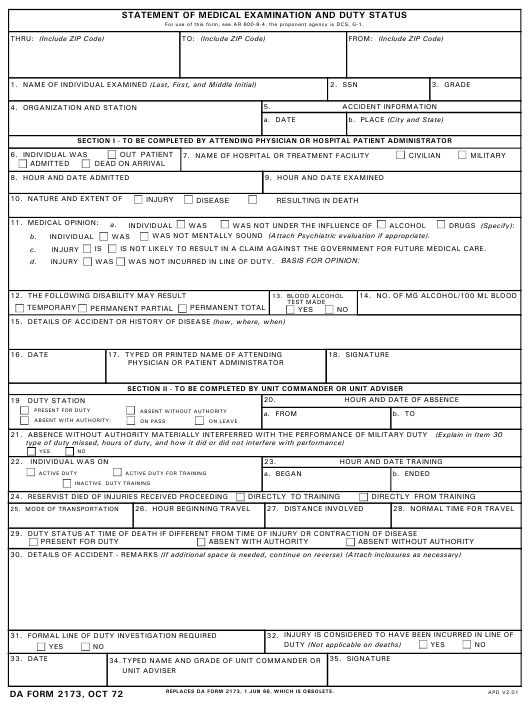 The first lines on the form require basic information about the Soldier and their case. This includes their full name, SSN, grade, organization, station, the date and place of the accident and the to and from addresses for forwarding the form. Section I is completed by an attending physician or a hospital patient administrator. Block 6 defines the physical state of the patient - admitted, outpatient, dead. Block 7 requires the name of the civilian or military hospital. Block 8 calls for exact admission hours. Block 9 shows exact examination hours. Block 10 requires a detailed explanation of the nature and extent of injury, disease or death. Block 11 is for providing a specific medical opinion. Box 11A specifies if the patient was under the influence during the accident. The substance must be specified if known. Box 11B identifies their mental state. Box 11C specifies if the injury may result in a claim against the Government. Box 11D specifies if the injury happened during duty. Block 12 specifies the level of resulting disability. Block 13 is for the results of the blood alcohol test. Block 14 is for specifying the level of alcohol in the blood samples if any is found. Section II is completed by a Unit commander or adviser. Block 19 shows the duty station at the time of the incident. Block 20 states the period of absence. Block 21 shows if the absence was with or without authority materially interfered with the performance of military duty. Block 23 specifies the period of training if the Soldier was on IDT or Active Duty for training. Block 24 is completed if the reservist died in the time of proceeding directly to or from the training. Blocks 25, 26, 27 and 28 are for specifying the mode of transportation, the time traveling started, the distance covered and the normal time for travel. Block 29 specifies if the duty status at the time of death is different from the time when the injury or disease was incurred. Block 30 requires details of the injury. Block 31 specifies if any further investigation is required. Block 32 shows the line of duty determination for injuries.